Funbox Media have today announced that they are to release Myst for Nintendo 3DS across Europe. 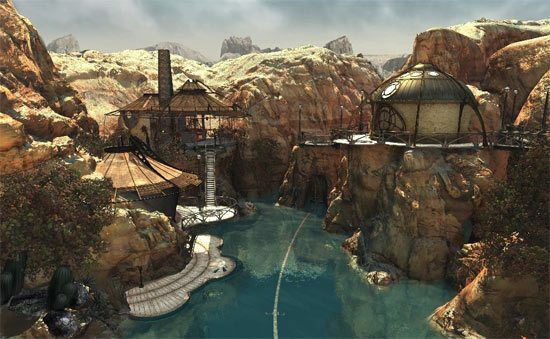 Having sold in excess of 13 million units globally since it originally launched in 1993, Myst has captivated players with its fantasy universe for years. The first-person adventure title includes six worlds, offering over 80 hours of gameplay as players hunt for clues and solve puzzles. Extra content is also provided in the form of new landscapes and the RIME Age, serving to enhance the Myst storyline. “We are delighted to be publishing Myst”, comments Mark Clemens, Sales Manager at Funbox. “This game needs no introduction and we’re sure it’s going to be a big hit with the fans that remember the original and those that will be new to one of the greatest adventure games ever, we’re sure we have a great hit on our hands and further enhances our commitment to bringing exciting products and licenses to the market across all platforms”. Myst will release for Nintendo 3DS across Europe in June.